A cut above the rest, the Ascot Dining Chair Black Velvet has a genuine wow factor. Exuding tradition and glamour, the Ascot is a must have item for your home. The plush black crushed velvet upholstery exudes a luxurious aesthetic, with a full webbed seat pad for premium levels of comfort. Steadfast and supportive, the high elegant backrest exhibits an armchair-like quilted button design and encompasses the body for a feeling of security. 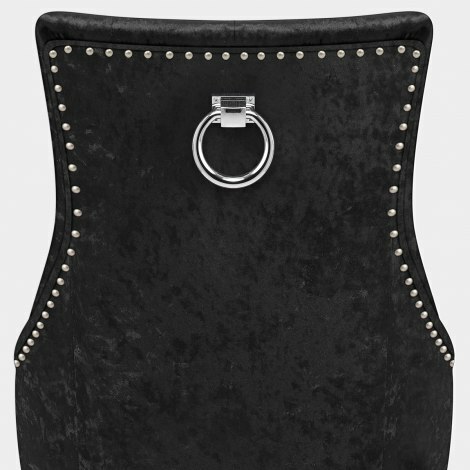 Edged with decorative metallic studs, it also has a chic chrome ring on the rear as a stylish accent. Supported by a solid wooden frame, the four sturdy legs display a sublime dark wenge finish for a harmonious look. With protective floor plugs to help preserve floor surfaces, it’s perfectly practical too. "The chairs are sensational!! Very glamorous"
We are absolutely delighted with our x6 black and x1 silver ascot velvet dining chairs. They arrived quickly and safely. They were very well packaged and protected. They are solid and very well made. The velvet material seems to be excellent quality. The studs and the metal piece on the back are excellent too. Overall one of the best purchases we have made over the past 20 years. The only aspect that could be a little better is the assembly instructions; these could be made bigger and easier to follow with an online video demonstration. Thanks and well done! Gorgeous chairs, and excellent prompt service.